The Washington Post‘s fact checker gave Rep. Alexandria Ocasio-Cortez (D., N.Y.) a "Three Pinocchio" rating for comments she made regarding the minimum wage and a living wage during a Monday interview. "I think it’s wrong that a vast majority of the country doesn’t make a living wage, I think it’s wrong that you can work 100 hours and not feed your kids. I think it’s wrong that corporations like Walmart and Amazon can get paid by the government, essentially experience a wealth transfer from the public, for paying people less than a minimum wage," Ocasio-Cortez said during a discussion with Ta-Nehisi Coates. Several hours after the fact-check was published, Ocasio-Cortez mocked Kessler on Twitter for using data she considered tainted by corporate interests. 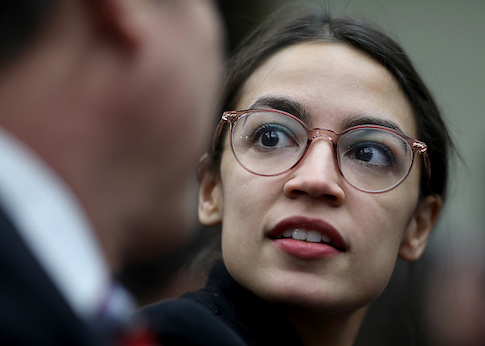 The author Ocasio-Cortez argued was in the pocket of big business is the former chairman of the Council of Economic Advisers in the Obama administration, Jason Furman. Kessler pointed this out in a reply tweet and added a second tweet saying the research had certain caveats that are irrelevant to the fact check's validity. Regarding the rest of her claim, the congresswoman's office sent the Post an article "about a proposal by Sen. Bernie Sanders (I., Vt.) that would require large employers such as Amazon and Walmart to fully cover the cost of food stamps, public housing, Medicaid and other federal assistance received by their employees." The article, also from the Post, pointed to evidence that up to one-third of Amazon employees in Arizona receive food stamps. The companies countered that the numbers are misleading and "reflect the fact that either the employees are choosing to work part time or that the entry-level workers may have been on public assistance when they first started." The fact check determined that the congresswoman's claim about companies receiving a wealth transfer is "dubious." "Economic theory generally assumes all costs and benefits of labor-related taxes and benefits are borne by labor — i.e., the worker, not the employer. So wages would be largely unaffected if taxes went up or public assistance went up. And the worker would still get paid the same, even if they had to carry the burden of new taxes or received enhanced benefits," the Post writes. The Post awards Three Pinocchios for claims that contain "significant factual error and/or obvious contradictions." Updated 5:32 p.m.: This post has been updated with Ocasio-Cortez's tweet about the fact check, as well as Kessler's response. This entry was posted in Politics and tagged Alexandria Ocasio-Cortez, Fact Check, Minimum Wage, The Washington Post. Bookmark the permalink.